Happy May 24 holiday to all our Canadian friends. 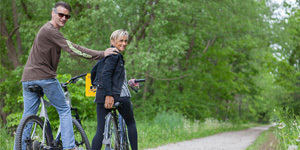 Tomorrow (Monday) is a Canadian holiday. I do believe it’s celebrated to remember Queen Victoria’s birthday. Not sure why we get a day of but I’ll take it lol. We spent most of today (which was a gloriously sunny warm day) taking down an old wooden sun pergola. Philip built it about 12 years ago and we decided it’s time was up. We purchased one of those metal gazebos which has netting and curtains to keep out those annoying mosquitoes. Of course nothing ever goes completely right for us and we were still at it around 7pm this evening. The instructions are hilarious and really don’t show you how to assemble it. We decided to call it quits and will finish it off tomorrow. It was time to enjoy a Barbecued Nectarines and Pistachio Salad with barbecued small potatoes. 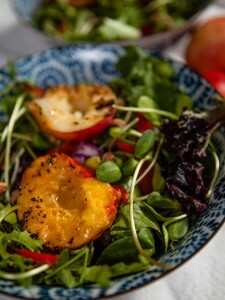 I preferred nectarines for this salad since the skin has a nice smooth texture. You can use peaches if you wanted. 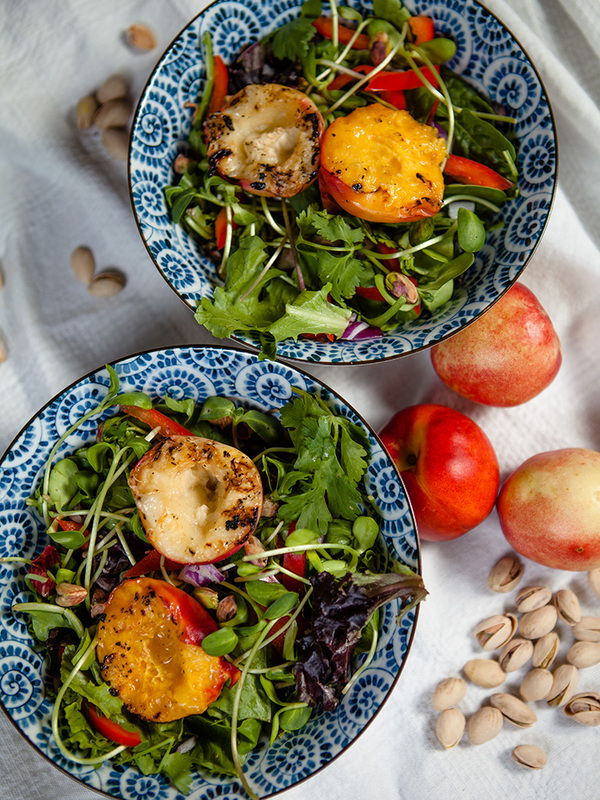 The nectarines make this salad very sweet which blends really great with the salty pistachios. In two salad bowls place 3 cups of mixed greens in each. Split the rest of the ingredients between the two bowls. Set a side while cooking nectarines. Brush nectarines halves with olive oil. I used 1 yellow flesh and 1 white flesh nectarines. You can also make this salad with peaches. Place on BBQ skins up and flesh down. Grill for 2-3 minutes. Don't over cook nectarines will go mushy. 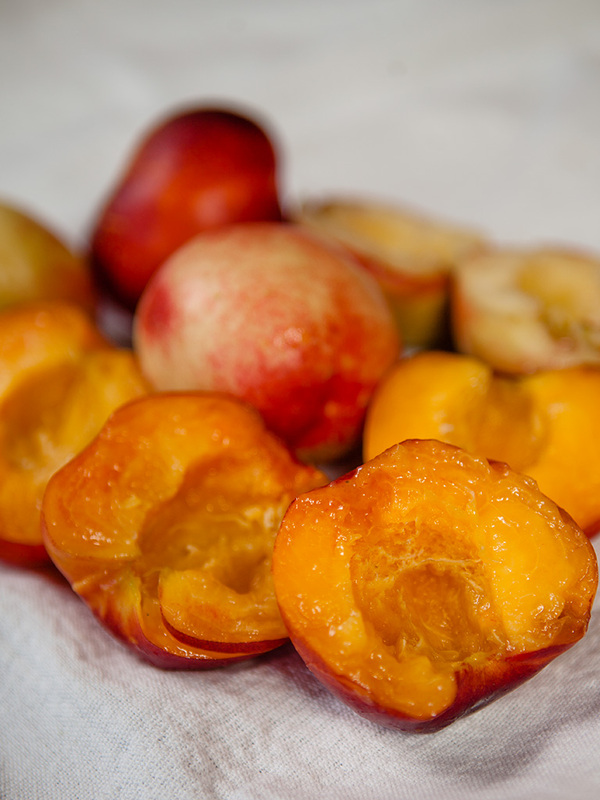 Your just grilling to bring out the natural sweetness of the nectarines. Place nectarines on top of salad. Drizzle in balsamic reduction. 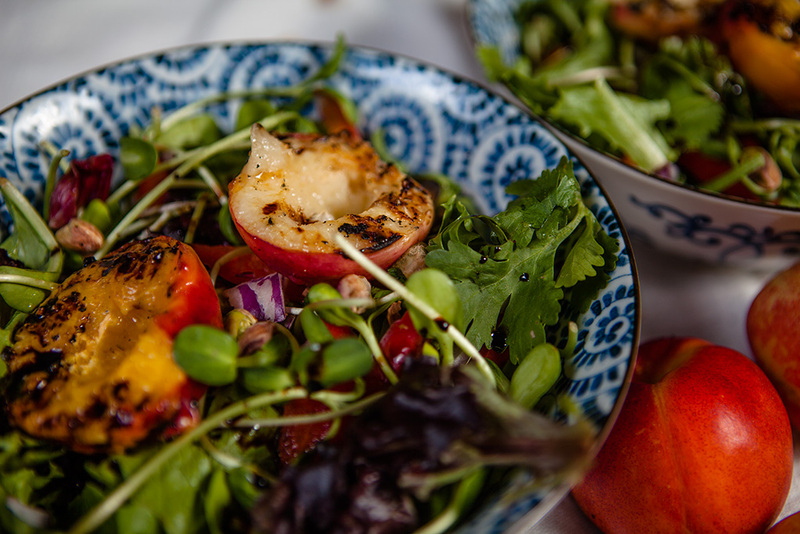 This salad doesn't need any fancy dressing the sweetness of the nectarines the salty pistachios and the balsamic reduction blend so well together.